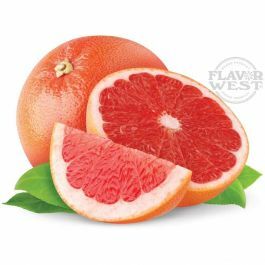 Natural ruby red grapefruit flavor is an irresistible addition that comes with the characteristics of natural red grape. A tart and cool, delicious fruity flavor for drinks, baked treats, ice cream, creamy liqueurs, jellies, confectionery and more. No artificial sweeteners. Type: Ruby Red Grapefruit All Natural Water Soluble Flavoring. Ingredients: Natural Flavoring, Triacetin and Ethanol. USP Kosher Grade Flavoring. Usage Rate: 15-20% for E-use. Flavor suitability: Drinks, baked treats, ice cream, creamy liqueurs, jellies, confectionery and more. Specific Gravity: .99 No Refunds on Flavoring. Man, this stuff is delicious! Start off light, it does separate a bit in VG so, shake well. Has a well balanced flavor on both the inhale and the exhale. Blends well with both green engine and blood orange that I've tried it with so far.